The WIA Federal Awards were established in 1947 and have been running continuously ever since, aided by many volunteers. For 60+ years many new awards have been introduced and some short term awards discontinued. Rules have also changed over the years catering for new trends, modes and band extensions. From the 1st. March 2007 all existing Federal Awards were updated and integrated into the new National WIA Awards Program. As of 2008 the WIA Awards program was further enhanced with the introduction of the Awards Committee. The Committee, comprising a mix of respected DXer’s and Contesters, was formed to aid the Awards Manager with the administration and functions of the Awards program in general. 2010 introduced a big revision of the Awards program. Since its introduction over 4,000 awards have been dispatched. 9. WIA 80, (80th. Anniversary) November 1989, discontinued May 1992. 11. Grid Square, December 1991. 17. WIA DXer 3, 5 and 9BDXCC. June 2005. 18. DXCC Honour Roll, (complementary award) January 2006. 19. 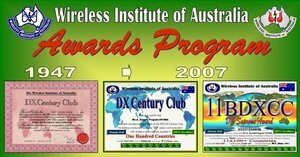 DXCC Excellence, (complementary award) January 2006. 20. 4, 6, 7, 8, & 10BDXCC, (complementary awards) 1st. March 2007. 21. WIA DXer 4, 6, 7, 8 & 10 BDXCC. 1st. March 2007. 22. Satellite DXCC,1st. March 2007. 23. UHF-CC, 1st. March 2007. 24. DXCC Data, 1st. March 2007. 25. IARU WAC Award available through WIA Awards program October 2008. 26. DXCC Data changed to DXCC Digital, incorporating all digital modes(RTTY-PSK etc, as well as SSTV). 2010. 27. 4-6-8-10-11 band DXCC awards deleted. 2010. 28. DXer of the Year Award now only awarded once per annum to one individual. If no one is deemed to be suitable in a given year, then the award will not be issued. 2010. 29. 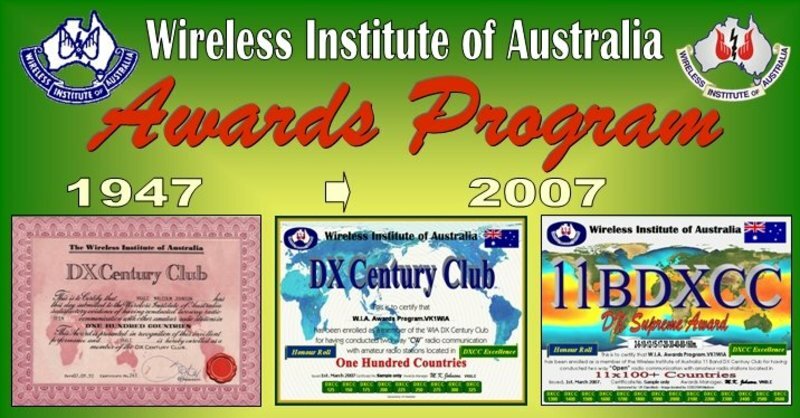 Both 5-Band DXCC Awards combined as a single 5-band DXCC award. 2010. 30. Paper award applications no longer accepted. All applications and updates must now be via email attachment on new forms. 2010. 31. 9 Sep 2010: verified eQSL's are acceptable for the award program. 32. Both PJ entities were deleted on 10-10-10 and 4 new PJ entities were added to the DXCC list. The new entities can be claimed for DXCC as from 01-01-11. 33. Feb-2013: New Multi-band DXCC, Multi-Mode DXCC, Grid Square & VHF/UHF Century Club application forms uploaded that support import of ADIF log. LOTW QSL accepted for awards. 34. Jan-2014: Online award system replaced spreadsheet based system. 35. Oct-2014: DX users given access to online system. 36. Apr-2015: Users can now update their DXCC Standings in real-time. No need to wait for next endorsement level. Most applications are processed within 30-days of receipt of fees and cover sheet. Emails are usually answered within 48-hours. We are currently in discussion regards making plaques available for Awards of Excellence and DXer of the Year for a nominal fee to cover the actual cost. On behalf of the WIA Awards Committee please enjoy our WIA Awards program, now and into the future. We look forward to your participation.